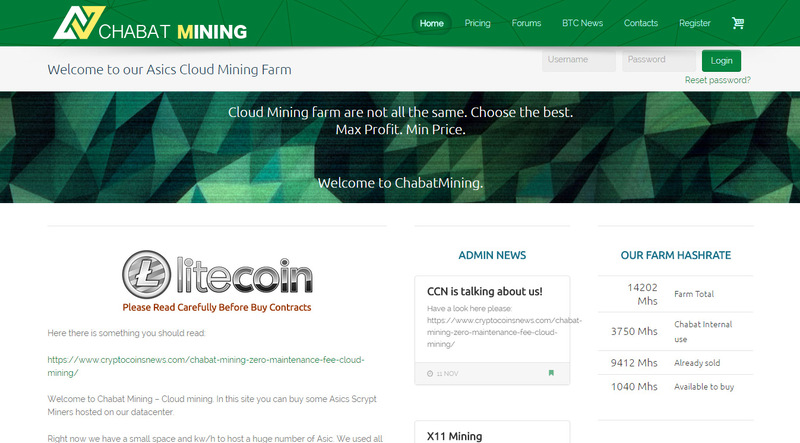 Recently we’ve been contacted by a new cloud mining service called Chabat Mining, and we’ve already seen it before that, but wanted to give it some more time before actually checking it out. 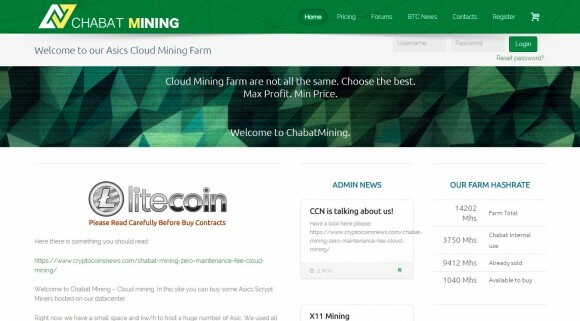 In our experience so far with some new cloud mining services that have later on turned out to be scams, most of them are usually gone in a month, so when we see a new one appear we are approaching it more careful. This is especially true when the service operators want to remain pretty much anonymous and do not provide a lot of information on their website about their mining operation, so doing a bit of research is a good idea. The website has been registered on August 20th and the first news on the website appear to be published on 26th, Archive.org has a snapshot of the website from September 22nd. We’ve actually found out about this website about a month ago, so we’ve decided to give it a go and try out the service since it is apparently still here. Being contacted by the operators of the service gave us the opportunity to ask a bit more information about the service and their mining operation. It seems the people behind Chabat Mining are from France, however their mining operation is based in Bangalore, India in order to take advantage of cheaper workforce and electricity there, or so we were told. We were sent the photo above as a proof of their mining operation, a not very clear image of a data center and the Litecoin mining equipment the service says they use is custom built based on 28nm ASIC chips. 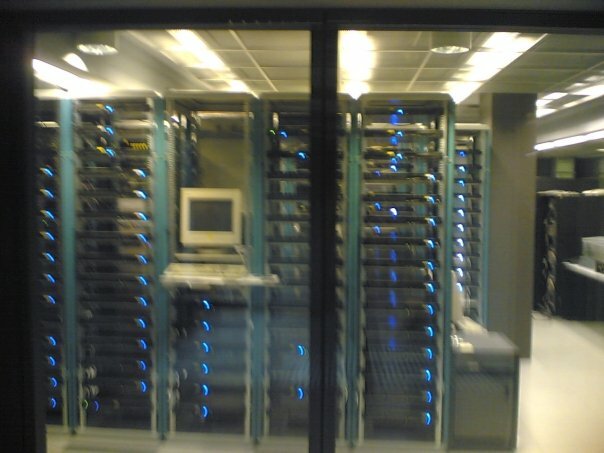 According to the statistics available on the main page of the service they operate a 14 GHS Litecoin mining farm out of which a little over 1000 MHS (1 GHS) are currently available for customers. What makes this service seem very attractive is the price they currently offer for their mining contracts, currently 10 MHS Litecoin Scrypt mining power will cost you $88 USD (were $85 earleir today when we have purchased a contract). The mining contract duration is 1 year with no maintenance fees, though apparently after that the contract continues with some fees – $0.08 USD per MHS for another year or three (not made very clear on the website). There is also a future contract available for pre-order where 10 MHS will cost you $69 USD, but the mining for that one will start at the end of the year, so not that much attractive. 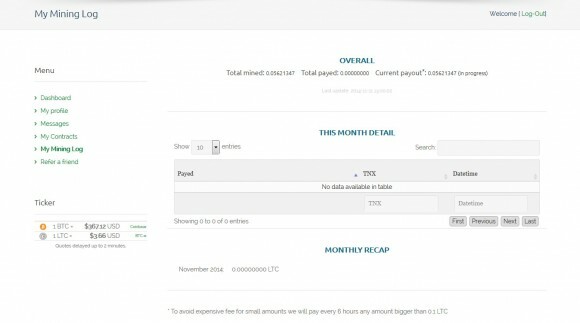 The service uses CoinPayments as a payment processor for paying with either BTC or LTC for the hashrate, but there is also an option to pay with PayPal, not something we often see with cloud mining services nowadays. 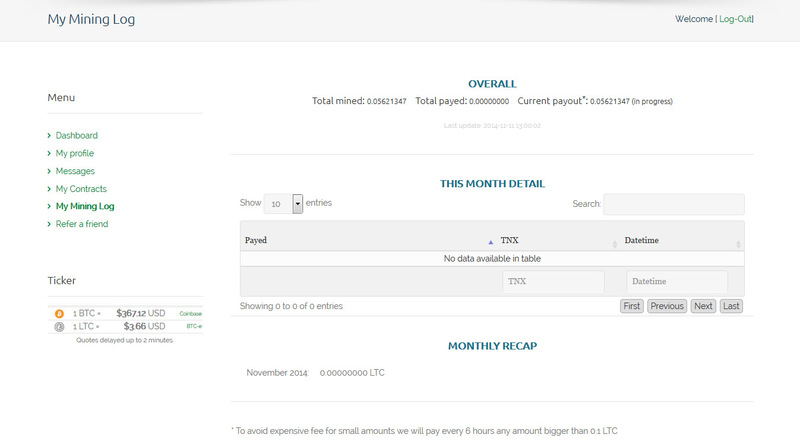 The payments are automated and ran every 6 hours if you have mined an amount larger than 0.1 LTC (Payments are only in LTC), otherwise the mined Litecoins will be sent once you have accumulated more than 0.1 on the next payment schedule. Our purchase of 10 MHS hashrate (order number a little over 100) that we use for testing the service went smooth and fast and pretty much within 30-40 minutes we got the hashrate available in our account and mining coins, though it could take some more time. The user account control panel and the mining information available is not the best we’ve seen, but it provides you with the most important information to help you keep track of your mining and calculate profitability and expected ROI time. If the current conditions for Litecoin remain the same you might be able to ROI in about 4 months with the current low prices and difficulty that has been showing pretty moderate increase for quite some time already. This is just a rough estimate however as it is really hard to predict what can and will happen in the next 4 months with Litecoin, but considering that some alternative services offer significantly higher prices for hashrate this deal might not be bad at all. Of course there is always some risk and the better the deal, the higher the risk usually is, so as usual we advice caution, start small and do not spend more than you can afford to loose. We’ve purchased 10 MHS hashrate and will continue to test the service and report our experience over time, so you can keep an eye out on how things develop further. Meanwhile, if you are interested in trying out the service you can use the link below to register, as following it you will get a 3% promo code for your first order, so even better price per MHS. Do note that once you register and add a contract in your Cart you will see the 3% discount code shown in the Cart, but you need to copy and paste it in the Coupon Code field and click on the Apply Coupon button in order for the code to be activated for your purchase… it will not be activated by default, just displayed for you to use it!